24 November 2017, the Watchdog revealed that Patriotic Front president Edgar Lungu chose his Minister of Health Chitalu Chilufya as his successor if his desire to go for a third term fails. Now we have established that Lungu and his fellow bandits have picked on Dora Siliya to be Chilufya’s running mate and vice-president of Zambia if their desire prevails. Lungu and his ring of thieves believe that Chilufya and Siliya can insulate them from prosecution for the numerous crimes once Lungu leaves office. 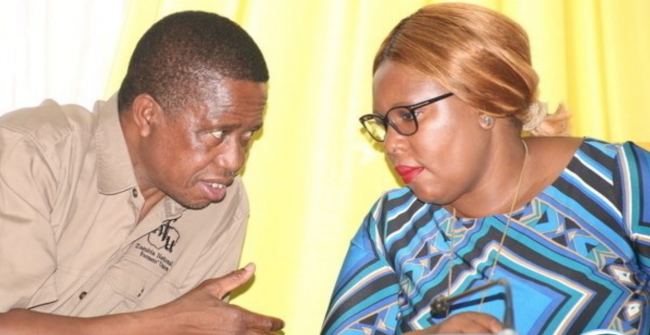 Lungu is not sure of what the constitutional court will decide on his desire to run for a third term. Even if the constitutional court declares him eligible to stand, he is not sure he can successfully rig the elections due to heightened public disproval of his poor performance, accusations of theft and corruption, internal division within his PF and most important his loss of support in the northern regions of the country. Even if the court says he can contest again, he may not stand for fear of a humiliating defeat, hence the bringing in of Chilufya and Siliya. Chilufya and Siliya have been chosen because they are as dirty as he is so they can not think of prosecuting him, or so he thinks.